We’d love your help. 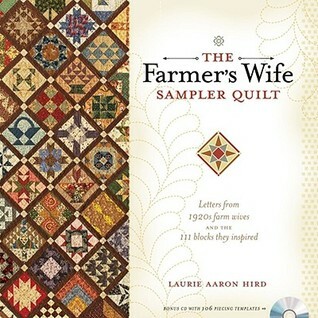 Let us know what’s wrong with this preview of The Farmer's Wife Sampler Quilt by Laurie Aaron Hird. The 1922, The Farmer's Wife magazine posed this question to their readers: "If you had a daughter of marriageable age, would you, in light of your own experience, have her marry a farmer?" The magazine at the time had 750,000 subscribers, and received over 7,000 letters. The best answers to this question are included in this book, along with the traditional quilt blocks they inspired. To ask other readers questions about The Farmer's Wife Sampler Quilt, please sign up. Does the original quilt have 111 or 99 blocks ? Kimberly Snyder The queen size (the one on the cover) is 111 blocks. I like all block dictionaries. I like them because I can always find a new block and each new block starts me on a fun creative spiral. The Farmer's Wife Sampler Quilt: 55 Letters and the 111 Blocks they Inspired is no exception and it includes letters! I love letters even reading other people's letters! The introduction is called The Changing American Culture of the 1920s and discusses "a time of political and technological changes." It is an interesting and tantalizing way to begin a quilt boo I like all block dictionaries. I like them because I can always find a new block and each new block starts me on a fun creative spiral. The Farmer's Wife Sampler Quilt: 55 Letters and the 111 Blocks they Inspired is no exception and it includes letters! I love letters even reading other people's letters! The introduction is called The Changing American Culture of the 1920s and discusses "a time of political and technological changes." It is an interesting and tantalizing way to begin a quilt book, especially for someone who enjoys quilt history. This page mentions the Farmer's Wife magazine, a source of some of the quilt block patterns mentioned in Jinny Beyer's The Quilter's Album of Patchwork Patterns, which I reviewed a few weeks ago. I commend Krause Publications for allowing Laurie Aaron Hird to include it. The Changing American Culture of the 1920s is followed by a page call 1922 Farmer's Wife Contest. I have read quite a bit on quilt history, but don't remember this contest mentioned, probably because it was not a quilt contest, but a contest asking for people's opinions about being a farmer's wife. The interesting part is that the organizers asked women to "talk it over with your husband, your children and your friends. Consider not only financial side of the question, but the moral and physical viewpoint and the things that make for real happiness." The way I read this is that organizers, and I am not looking at the complete list of directions and rules, assume that their readership is smart and their opinions worth knowing. I love that! The responses are summarized VERY briefly on page 12 and then the author launches into "How to Use this Book" and then the quilt blocks and letters. The first few sections are short, interesting and well worth taking a few minutes to read. The response letters are concentrated in the middle section of the book followed by some minimal piecing directions in the back. The author describes the respondents to the contest as "articulate, optimistic and visionary..." (pg.12). After reading a few of the letters, I have to agree, even though I know they were putting their best foot forward in order to win the not insubstantial prize money. I do have a few beefs with this book. The idea is that you make these blocks with templates. the author made her quilt by hand piecing all the blocks. I really have no problem with templates or hand piecing. You all know this from my adventures with the Flowering Snowball. The crazy way I have heard of people using templates for this project (which has taken hold in the Modern Quilt community) is frightening. People make templates and then rotary cut around a thin piece of paper with a bit of template plastic. This sounds like a recipe for disaster to me. The problem I have is that there are no rotary cutting instructions (though you can buy an EQ6 or EQ7 CD with all the patterns on it). I understand the need to slow down, quilt more slowly, take your time. However, in this day and age, I think it is important to include rotary cutting instructions. Quiltmakers just do not use scissors to cut out pieces very often anymore. There are also no line drawings of the blocks. I think this is a problem, especially for beginners. People need to be able to see the pieces without the colors the author chooses. Yes, the reader could look up the line drawings in Jinny Beyer's book, but why not just have a small line drawing available with the color pictures of the blocks? Cost probably. I am not that fond of the fabrics used and would love to see an alternate color way included in the book, but it can be done in EQ7 (with the add-on CD) pretty easily. I bought this book primarily for the quilt square samples and instructions, but I found myself intrigued with the book's other contents. Letters written during the 1920's from farmer wives are featured alongside the quilt block photos. The letters are a brilliant gateway into the past and talk of what was present to the women and their families. It was a fun read to take along and read at leisure. The many blocks are great to see, but the letters make the book special. although there was a nice variety of blocks, i gave this only 1 star because of the lack of directions or at least cutting measurements. that was a real disservice to quilters buying this book. i would think twice before purchase and get it from the library instead to enjoy it. I was really really excited about making this quilt. Then I realized I had to use templates. I decided to give it a go anyway because I really want to do this quilt. I hate the templates. I don't like using them at all. I don't understand what is so hard about saying "cut a 2" x 2" square" My advice to the author is this: Next time include measurements for those of us who despise templates, it would be really nice. I still plan on doing the quilt because I love the patterns. However, I'm going to have to sit down and measure all the templates and then go ahead and cut them the way I know how. Good Luck if you don't like templates!" Your criticism is well-founded, and I agree totally. The measurements should have been included, and I have kicked myself more times than I can count because I didn't do it. It was ignorance on my part that they were left out, and I can't blame anyone else but myself. Since I couldn't change The Farmer's Wife, I took all the feedback that I received and greatly improved and expanded the CD for my second book, The Farmer's Wife Pony Club Sampler Quilt. Thanks for your comments--you were right. Oh my Ms. Hird! I never expected a response from the author. I do love your quilt and found a quilting group on line where some one figured out all the rotary cutting instructions so that has helped immensely. :) There are still a few of the blocks that call for using the templates and that's OK. The quilt is lovely and the few blocks I've done I'm so pleased with. Thanks for taking the time to respond to my comment. :)"
The book contains letters written to The Farmer's Wife magazine in 1922 saying why or why not they would want their daughters to marry a farmer. The reasons were interesting and still relevant today. There were only a few letters that had the slang of those days that reminded me of the times in which the letters were written. A lot of the women also had experience living in both the city and the farm life and though the city women look down on them, the women pity the city women for not having t The book contains letters written to The Farmer's Wife magazine in 1922 saying why or why not they would want their daughters to marry a farmer. The reasons were interesting and still relevant today. There were only a few letters that had the slang of those days that reminded me of the times in which the letters were written. A lot of the women also had experience living in both the city and the farm life and though the city women look down on them, the women pity the city women for not having the equal treatment in marriage or the community that they have, as well as the freedom of the pocketbook. Morality of farm life was brought up often and compared to the "entertainment" in the city. While this was fun to read, and I loved the stories famers' wives had to share in the 30's, this quilt was way outside of my range. There were no measurements or cutting templates or anything. I found a website with some cutting instructions for these blocks, but it just isn't worth it. Way too complicated. I'll be looking for another sampler to work on. One sad thing about the stories: the top three entries from the essay contest weren't included in this book!! What a disappointment!! I want to While this was fun to read, and I loved the stories famers' wives had to share in the 30's, this quilt was way outside of my range. There were no measurements or cutting templates or anything. I found a website with some cutting instructions for these blocks, but it just isn't worth it. Way too complicated. I'll be looking for another sampler to work on. I love reading this book, mainly because I love history and this book scratches that itch. If you're looking for easy piercing techniques,b it's not here. These blocks are pieces by template. I appreciate the historical nature of the book and CD, but I would like modern quilting measurements and cutting. If you hand piece, pick this book up. The templates are accurate and helpful. You'll have a block together in no time. Although not a "page turner", this was an interesting book. The wives made very compelling arguments for having their daughters' marry farmers. Real embrace of technology here. I would think, that for the most part, these were well-educated and fairly prosperous farmer's wives. The articulation of the letters was amazing. It was fun to see which quilt blocks were assigned to each wife. I am going to mark a few of my favourites and hopefully use my scraps to make some up into a lap quilt. I'm not a quilter, so both block patterns and illustrative CD mean little to me. The letters themselves, written by country women in the throes of the 1930s Great Depression, are always interesting and often inspiring. They provide a thumping depression-check for any country girl feeling oppressed by poverty and the times. So the quilt is nice enough; a sampler of traditional blocks. I wasn't really inspired to make it. But the letters are fantastic, and by far the best reason to read this book -- well written, and a fascinating glimpse into the lives of farm wives in the 1920s. Wonderful book with letters from these women - any of them could have been my great grandmothers! I loved the stories and also it comes with a CD and templates for making a beautiful quilt in any size! I enjoyed reading about the farmers wife's who lived in the 1920's and why they wished their daughters to marry farmers like they did. And there are plenty of 6" block patterns to choose from if you enjoy traditional sampler quilts. I am currently working on this quilt- the blocks are gorgeous, and the stories that go along with the blocks are wonderful, as well. A 2013 Christmas present from Nathan and Courtney. Love this book. Not only beautiful quilt blocks, but very interesting to read the entries from a Farm journal essay contest, circa 1920. Inspiring read, inspiring quilt! Mom is going to love this for her b-day present. Charming. Comes with a CD with templates for all the blocks and assembly diagrams for four different quilt sizes. My latest obsession!!! This is absolutely beautiful - 26 blocks done, 75 to go!! Love, love, love it.